It was spring, and Eastern Avenue ran gold with glitter. The shimmering gold plastic found its way into pavement cracks, into Taste baguettes, into hair, into soy lattes, into mouths, into sealed physics labs. There was no escape. Only glitter. “This is not a good omen,” said Verge Director Tom Walker as a girl dunked her head into a bowl of glitter. 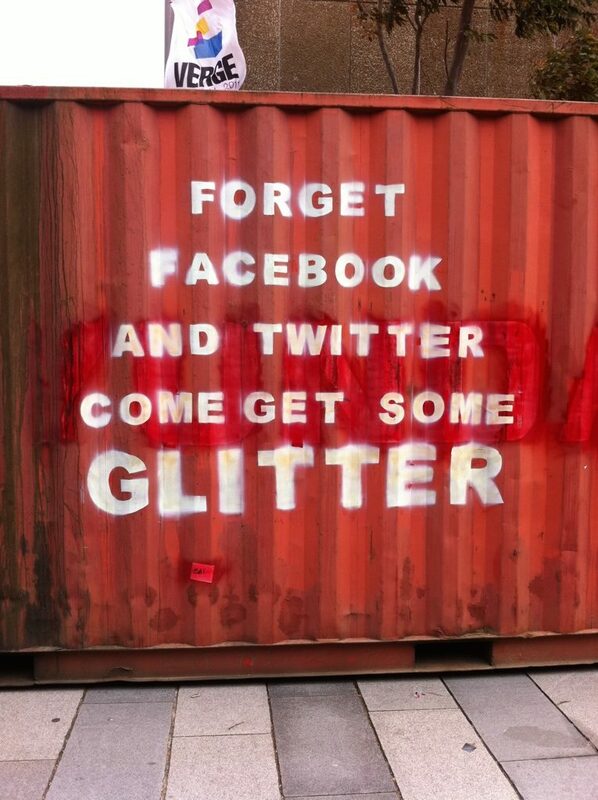 In 2011, the Verge Festival brought a dozen shipping containers onto Eastern Avenue, each of which became a student-curated art installation. Some containers featured framed photos or graffiti art. Some featured projectors playing short films. And one featured roughly thirty litres of glitter. Marcela Ordonez created “The Glitter Project” to “start a million conversations” (mostly variations on “why are you covered in glitter?”). The bottom of her shipping container was hidden beneath a centimeter-deep glitter layer. The only other element of her installation was a metre-wide bowl overflowing with – you guessed it – more glitter. Within an hour of Verge festival opening, the wind had blown glitter through the container’s open door down Eastern Avenue. The exhibition was incredibly popular. There was always at least one student in the container throwing glitter in the air or letting it run through their fingers. Verge Director Harriet Gillies says The Glitter Project “really succeeded in making the experience of walking down Eastern Avenue different during Verge than any other time of the year”. First-year student Lane Sainty found it was “a great talking point, particularly when meeting new people in tutorials”. Chloe Paul says the glitter became “a heat map for seeing where students spent time on campus, a reminder that university is about being there with other people”. Will Allington agrees: “glittergate was the first time I felt like I was part of a campus wide phenomenon”. “I had glitter in my tear ducts for like a fortnight,” said Eleanor Gordon-Smith. Caillin Mckay remembers “people started dumping glitter on other people and that was really Not On”. Former SRC president David Pink disagrees, saying “people started attacking each other with glitter dumps. So much fun”. Eventually the exhibit had to be closed when the glitter made its way into a physics student’s PhD experiment. An email sent to the Verge directors began “awesome though the idea seems, the glitter thing kind of isn’t going so well for researchers around campus. “The glitter seems to pick up a static charge and stick to things, making it very much more difficult to clean away from a vacuum system,” the email continued. Two years and 13,000 kilometers later, I started exchange at University of Texas by finding some Verge glitter in my backpack. Love it or hate it, The Glitter Project changed Eastern Avenue. For better or worse, every student on campus remembers Verge Festival 2011.